This hat uses Slip Stitch Ribbing, page 44 and Long Slip Textured Pattern, page 93. For this one, I added bands to break up the pattern and also see what happens when you use two colours. For this pattern stitch, you do a base row, then slip every other stitch in that base row three times. You then do another base row and slip the stitches you didn’t slip before. For the light purple, I used the same colour for all eight rows. In the bands I used one colour for the base row and a different one for the slip rows. I used white for the base row in the lower band with three row of dark purple. In the upper band I reversed things and did dark purple for the base row and white for the three slip rows. The colour in this photo is off, but I am using the same dark and light purple as the other hats. 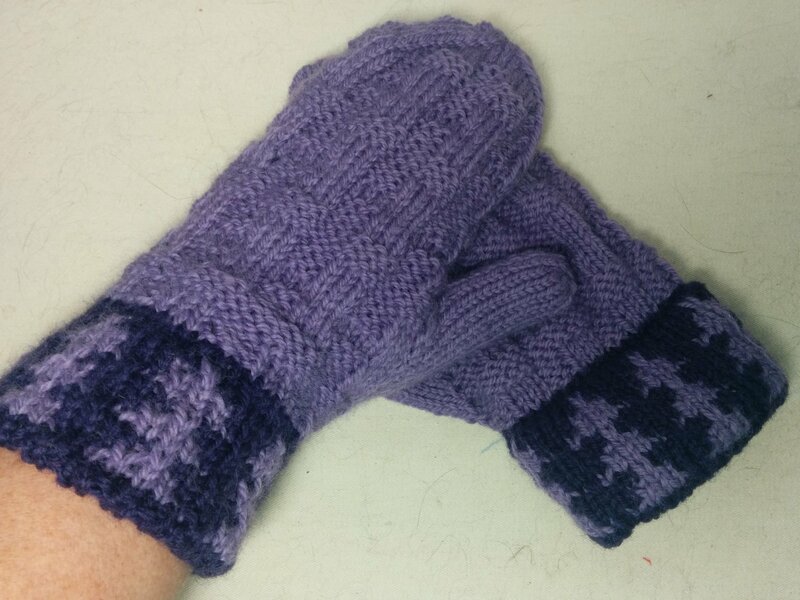 It uses Triangle Check, pg 60 for the cuff and Harris Tweed Pattern, pg 22 for the body of the mitts. This entry was posted in Barbara Walker and tagged A Treasury of Knitting Patterns, Barbara Walker, Patons Classic Wool on August 28, 2015 by gillianknitter. Now that’s a pile of knitting! I like #1…sort of a ponytail/heat removal system for possible hot flashes…lol I have a UFO from BW book…won’t say how long its sat on the needles…. your making me want to go dig it out and get it done. Your “purple haze” is lovely but for me, I don’t like the pattern on hat No. 3. Hope all is well.